Is mCommerce (Mobile Commerce) taking over eCommerce (Electronic Commerce)? To answer that question, we need to study about the changes in the amount of smartphone users every year, marketplace of mobile apps, and latest business news that related to mCommerce industry. These are the areas to look at for the signs of mCommerce slowly overtaking eCommerce and I am going to show you 5 of them. A report published by comScore site shows that the sales of mCommerce in America hit 10.6 billion dollar in the first half of the year 2013. It is estimated that it could reach 25 billion dollars by the end of 2013 which representing a growth of 24% compares to year 2012. So what is the reason behind the rise of mCommerce sales? We can refer to the amount of smartphone users in United State as the mCommerce sales are strongly connected with the amount of smartphone users. Source from: PewResearchCenter Survey conducted on 17th of March-12th of April, 2015. Smartphone data based on survey conducted on 10th of June-12th of July, 2015. The graph above shows that 35% of the adults in the United States own a smartphone in the year 2011. The amount keeps on increasing and reach 68% in the year 2015. The amount of adults who own a computer have stayed roughly between 70% to 75% from the year 2004 to 2015. It means that the percentage of smartphones and tablets users grew in recent years while desktop and laptop users stayed flat. Other than the increment of smartphone users, we can take a look at the amount of time smartphone users spend on their smartphone. As internetretailer reports, 80% of United State consumers mobile browsing time is on apps. They spend more time with retailers online with their smartphone and tablets compared with desktop or laptop. Therefore, organizations in eCommerce industry realized that there is a huge potential to growth in mCommerce market. Due to the rise of mCommerce sales, there are many eCommerce companies that leaping ahead into mCommerce industry recently and one of them is Amazon. Amazon currently entering mCommerce industry with Apple’s iOS features. They are the first retailer from eCommerce industry who support Apple’s Universal Links. Apple’s Universal Links are the Apple new launched feature that used to improve mobile deep linking. With Universal Links, iPhone users who’s been using iOS 9 and above can tap a link to the website and redirect to installed app without going through Safari. The iOS will open the app page for the user automatically when the web page URL matches with the app page URL. Amazon with universal links provides a better user experience to their users as the whole process of using the feature is simple and fast. The users just need to click on Amazon’s link on the Amazon app and Amazon’s website page will appear on the app page. This helps them to increase Amazon’s conversion rate as well. Other than Amazon, Apple also has came out with new mCommerce project by partnering with a German multinational software corporation, SAP SE (System analyses and Programme networking; Systems, Applications & Products in Data Processing). They combine powerful native apps with the SAP HANA Cloud platform. With the new platform, organizations are able to customize their own native iOS apps that fit with their own business need. The new native business app is used by the users to fully leverage the rich data in their own organization systems. From this sign, we know that Apple Company realizes about the importance of mobile apps and the increment of the apps users.That’s the reason why they created this platform for the organizations to come out with their own mobile apps for own business use. This factor helps to encourage more eCommerce organizations to leap ahead into mCommerce industry. The other sign that we can refer to is Wechat mobile app. It is used by the citizens in China not only for messaging and calling but also used as an e-wallet to make payment by using smartphone. Nowadays, WeChat is powering a mobile commerce boom in China urban area with their Wechat’s mobile wallet function.The citizens are able to pay their bills or purchase goods and services with the tap of their phones with QR code. The ways of using Wechat wallet is simple and fast, so that’s the reason why they started to implement this mobile app into their daily life. As we know, China is a country with the highest population in the world, so it makes a huge impact on the mCommerce industry when the citizens using any one of the apps. When apps users growing in China, it benefits the mCommerce organizations who developing mobile apps by generating a huge revenue to their organizations. 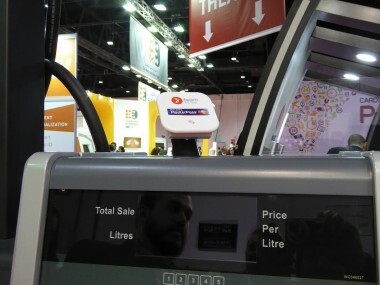 Due to the increment of smartphone and tablet users, MasterCard Company has started leaping ahead into mCommerce too. According to gulfnews report, MasterCard has collaborated with Beam Wallet Mobile App and start their payment with smartphone project. They came out with the mCommerce payment and reward platform which known as MasterPass. MasterPass is a digital payment platform that helps the users to simplify the way of shopping online. The users are able to use it to make payment with their mobile by tapping it on the scanner. The platform can be used at more than 3,000 stores in UAE (United Arab Emirates) such as Carrefour, Costa, Subway, Enoc Gas Station, Cold Storage and so on. With all those signs, we can clearly understand why eCommerce organizations decide to leap ahead into mCommerce industry. Yes, that’s because there are many opportunities to grow in mCommerce industry because almost everyone around the world including kids are having their own smartphone or tablet. Everything is becoming more efficient and convenient with mCommerce in the world of business. Other than this 5 signs, there are many other signs of mCommerce overtaking eCommerce. After finish reading this blog post, do you agree that mCommerce is taking over eCommerce? Please feel free to share your opinion with us.